The revision I’m currently doing is difficult on a number of levels. It’s quite major – requiring a re-thinking of parts of a story – a journey – I thought I’d sorted. There’s no easy fix, or not in my mind, anyway. It’s not a matter of strengthening a character’s motivation, consolidating the setting or adding some cunning foreshadowing. It’s more a deeper dive into the story, heading for the centre of the labyrinth to confront and understand the minotaur. Of that’s what it feels like. Perhaps in the third redraft I missed, slid past or even evaded something dark. A dark truth, wild and lonely, that the story needed before it entered the public world. I’m not even that I’m getting there yet, but my journey has changed to accommodate the hope and intention that I will. I bought a typewriter. A manual, portable typewriter. This purchase was inspired partly by re-reading Susan Bell’s The Artful Edit, a book I recommend to all my writing friends, students and new writers. Her advice on macro and micro editing is great – worth photocopying and sticking on the wall above your writing desk. But she also includes case studies from other writers who recommend their own approaches. One of these talked about writing the first draft on a typewriter. Okay, I’m not writing a first draft. So what’s the point? The point is that this is a re-thinking – I don’t want to be stuck referring to my earlier work as I rewrite. I want to be able to dive into the problematic sections and write them again – fresh. Unhampered by the contemporary convenience of cut and paste. I want the words to come differently and be different. I guess I could have done that by simply starting a new word doc and typing straight on the screen, but I was craving a completely different approach. I wanted something that would shake up the process a little. I also wanted a new way of writing poetry. 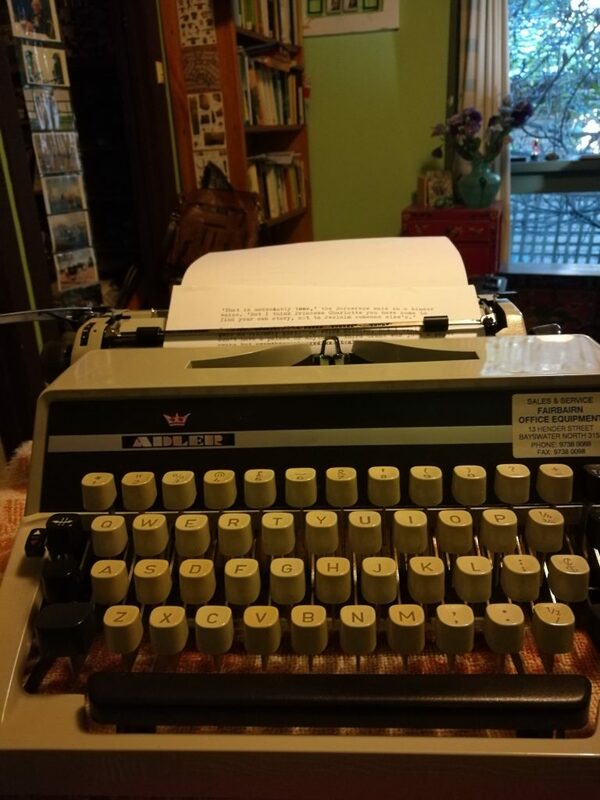 Typing poems takes me back to the early days of my poetry apprenticeship where a poem was typed and re-typed, the drafts sifting on to the floor. The poem was begun again and again so by the time it was finished to some satisfaction many lines had been retyped ten, fifty or one hundred times. The poem learned its way on to the page. Yes, I hand-write poems, too. I keep a separate poetry journal in the same leather folder as my daily journal. But handwriting doesn’t equate with type and this means it’s harder to see the line endings or the white space. I woke up just before Christmas and announced to the world, ‘I need a typewriter.’ I could feel it in my fingertips. I started writing on a typewriter – my grandfather’s spare Underwood. He would sit at his desk on the covered verandah in Sydney working and I would sit at the Underwood on a sturdy, folding table next to his and we would writer, after my swimming lesson, until lunchtime. I was writing, among other things, movie blurbs. ‘Wartime. An ocean and a battle separated them. Would their love survive?’ Those haiku romances gave me great pleasure. When I returned home from the summer holidays I typed away on a smart, red, portable Olivetti. Later I had an old Smith Corona electric typewriter – oh, the joy of correcting tape! This one is an Adler. I bought it on Gumtree. It’s had only one owner. She and her son are relocating to Queensland. He told me that she hadn’t really wanted to sell it, but she was glad it was going to a good home. She came out of the bedroom, white-haired but robust, wished me a merry merry and gave me two spare ribbons. It’s probably going to ruin my fingernails – which have never been so long and paintable as they are now. But I love the noise! The cheerful clackety clack of the keys! This was the sound I would go to sleep to as a baby. It’s in my DNA. It’s so much more joyful than turning on a computer, putting in a password and then confronting decisions – do I check my email, Facebook, Insta? Do I just log on to work for ten minutes or prep that upcoming class? (‘BFF – or not! Depictions of female friendship’ – a look at Margaret Atwood’s Cat’s Eye and a couple of short stories. Starts in February at the CAE if you’re interested and in Melbourne.) And then the agonised finding of the right folder with the correct draft…. No, I sit down on the back deck or at the lap top table and the keys jump to my command, clackety clack. The pages mount up on the floor beside me, just as they did all those years ago when I wrote for sheer joy because everyone of any importance in my life made up stories on a typewriter. Not only is it slowing me down, evading the cut and paste demons and allowing me to rethink but it’s also brought back that joy. Anxiety is laid to rest – I can’t hear its grim whispers while the merry typewriter keys go clackety clack, clackety clack!